In One Night to Change their Lives by Tina Beckett, Adelina ‘Addy’ Santini and Garret Stapleton aren’t looking for a relationship. Not after all they’ve been through in their pasts with Adelina’s husband cheating on her and Garret losing his family tragically. Still, Garret finds it hard to keep his distance, especially since he doesn’t want Addy to lose as much as he has when it comes to their professional lives. Will Addy and Garret give each other a chance or will they lose their shot at happy ever after? Every medical romance I’ve read by Ms. Beckett has entertained me from start to finish, as she writes complex characters with interesting back stories, compelling dialogue that has me enjoying the growing relationship between the two main characters, and challenging obstacles for the characters to overcome and this story was no different. The way this story started drew me into the story immediately because of the opening line. The heroine’s ex is a total jerk and it’s understandable why she’s so determined to get rid of anything that reminds her of him. However, it was from the moment the hero and heroine come face-to-face for the first time where this story really gets interesting, as the hero worries about the heroine because of his own past and is worried she’s pushing herself beyond her limits. Will the heroine burn out or does she know when enough is enough when it comes to her career? Will she put a patient’s health at risk in an attempt to forget what’s happened in her life? With the main characters, I loved the hero. He’s so genuine, so caring and I loved how he progressed. He begins to realize his life as a doctor isn’t completely over, even though he is unable to perform surgery anymore. I also liked how the heroine challenges Garret to try new things and helps him since he continues to struggle with what he’s been through. He has so much to offer in terms of being able to pass on all that’s he learnt as a doctor and could be doing so much more than just being an administrator for the hospital where they both work. While the heroine, she’s smart, resilient and I liked how sassy she was at times. She wasn’t afraid to challenge the hero because she knows her limits and has faith in him that he can achieve anything he sets his mind to. Will the heroine be able to convince the hero that he can do anything he sets his mind too? Overall, Ms. Beckett has delivered a really good read in this book that had me smiling because of the occasional teasing banter between the pair that ups the sexual tension; and where the chemistry between this couple was convincing and intense in going from acquaintances to friends to lovers; the romance was delightful, as these two help each other to heal from their pasts; and the ending had me loving the hero’s determination to win the heroine back after their relationship goes awry. How could he not want Addy in his life, especially when he’s been given a second chance at love and happiness? However, it was the epilogue that wrapped this story up nicely and brought happy tears to my eyes, as the hero will do anything for the heroine. 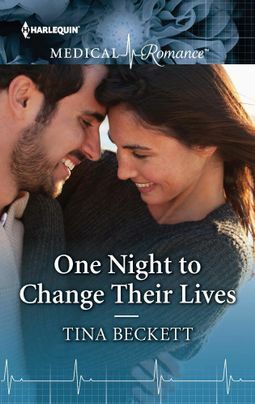 I would recommend One Night to Change their Lives by Tina Beckett, if you enjoy medical romances, the friends to lovers trope or books by authors Amy Ruttan, Annie O’Neil, Amalie Berlin and Carol Marinelli. Can their surprise baby…heal his broken heart? Since hospital administrator Garret Stapleton lost both his wife and his daughter, he’s determined not to give away his heart again…until gorgeous but guarded ER doc Addy Santini gets under his skin! Soon they embark on a scorching affair that has unexpected, life-changing consequences. When Garret’s tragic past threatens their happiness, can Addy’s surprise pregnancy lead them to their happy-ever-after?